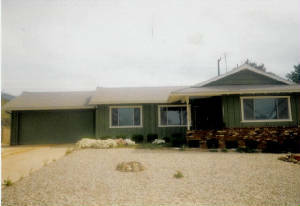 This first photo was taken by the real estate agency for an ad in an effort to sell the house. There was gravel on both sides of the driveway and a small garden bed with bushes and a few plants growing up near the house. While I've never been fond of gravel yards for their lack of aesthetics, it was admittedly less work for me as a single woman. There was enough work to do with weeding, planting, and watering that I was grateful that I didn't have to mow grass! 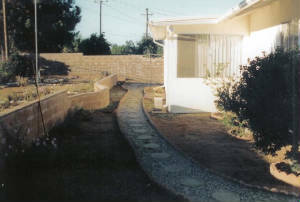 Photo 2 shows the upper terrace of the back yard after I moved in. 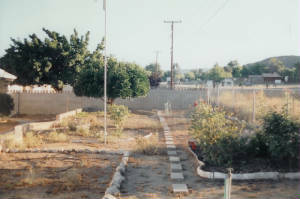 Notice the cinder block "walkway" down the middle, and the aluminum border around the rose flower bed on the right side of the photo. The border looked nice at first, but was very easily bent when tripped over or stepped on, after which it looked pretty ratty! It didn't take me too long to replace it with rocks that were in other parts around the yard. 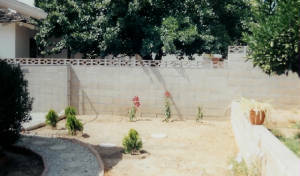 Photo 3 shows a small portion of the lower terrace on the north end of the backyard. 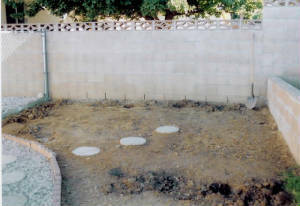 My plan was to create a meditation garden in that space, which is illustrated in photo 4. I planted three bougainvilleas against the wall and four arborvitae plants in front. For reasons unknown to me, the bougainvilleas died, but the arborvitae plants survived and thrived. Later on, as you will see, one of the arborvitaes was transplanted to the upper terrace. Photo 5 shows the backyard sidewalk consisting of stepping stones within the gravel with a scalloped brick border. It served the purpose, but made it challenging to roll anything with wheels over it, particularly when the item was too wide! My cats seemed to express their dislike for all the stones, too, either by avoiding them altogether or by walking gingerly over them when they had no choice.